CIMCO DNC-Max is the most trusted CNC communication software on the market today, designed to make every aspect of CNC communications more reliable and efficient. CIMCO DNC-Max works with your existing CNC machines, robots, PLCs and test stands and provides a full-featured solution for managing and transferring CNC programs. Supports dripfeeding, downloading, and uploading via parallel, RS-232, RS-422 Ethernet and wireless Ethernet – and supports program transfers to be initiated directly from the CNC control. 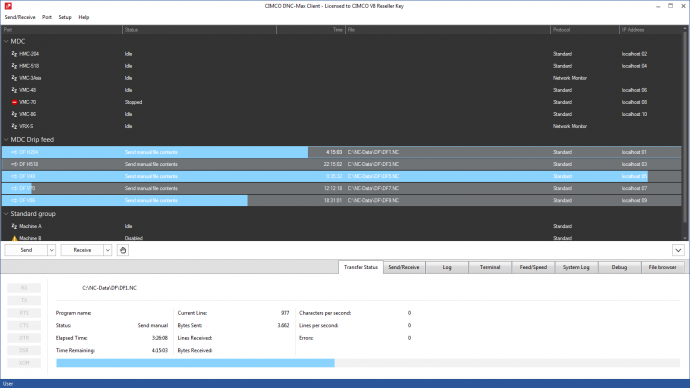 CIMCO DNC-Max is a Client/Server solution consisting of the DNC-Max Client, DNC-Max Web Client and DNC-Max Server. The DNC-Max Server is the core component of DNC-Max and handles all communication activities and calculations. It can be run as an application or as a service in the background as required. 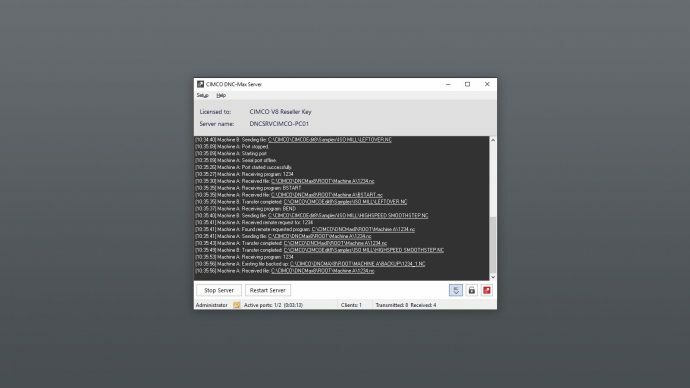 In addition to the stand-alone DNC-Max client, the full DNC-Client is now also available inside the editor, making CIMCO Edit 7 a universal application interface for both NC-Base and DNC-Max users. 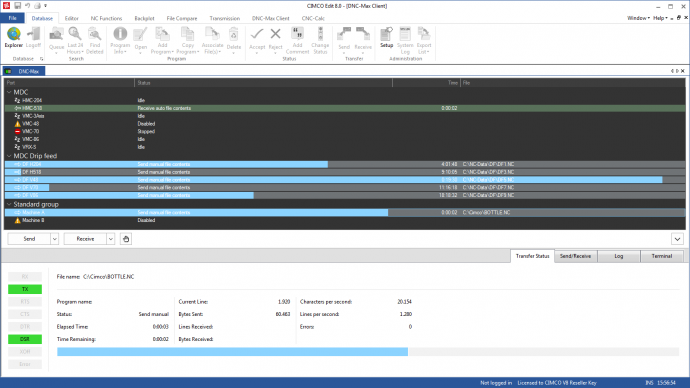 The DNC-Max Client is the PC interface of DNC-Max and allows users to manage local or remote file transfers, monitor machine ports, and perform remote network configuration and administration of multiple servers – from a single point. 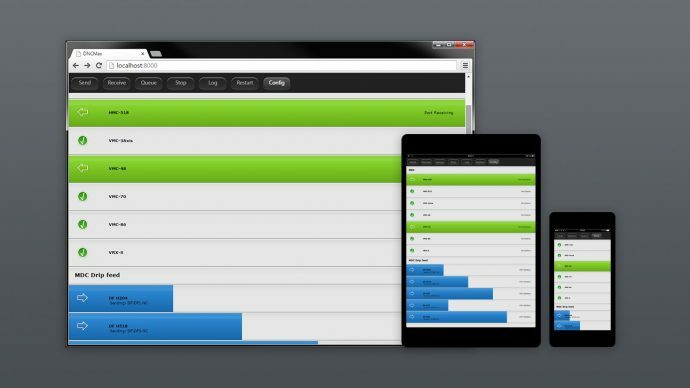 For mobile devices the DNC-Max Web Client offers a browser based interface for managing DNC-Max – and both PC and Web client can access multiple DNC-Max Servers across a LAN, WAN, or even the Internet. 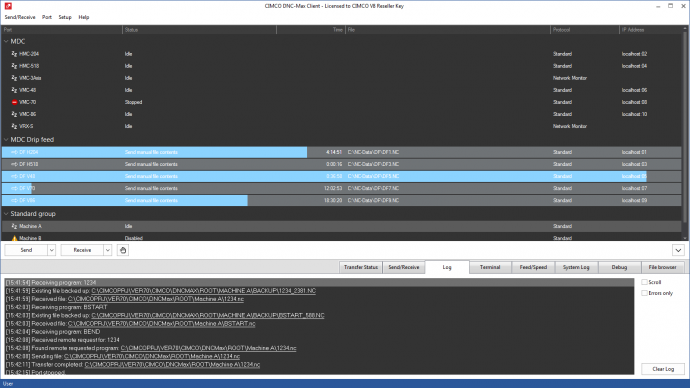 The DNC-Max Web Client can display the current program transfer progress and state of all your machines. You can send, receive, and preview CNC programs using a built-in file browser showing your files on the DNC-Max Server – just like with our regular DNC-Max PC client. It is even possible to stop transmission of programs, restart ports, and also remove programs from the transmission queue directly from the web interface. The advanced remote control features of DNC-Max allow operators to initiate program transfers directly from the CNC control or from a mobile device using the DNC-Max Web Client. Programs, sub-programs and even entire directories can be requested in one operation directly from the CNC control – and for Ethernet controls it’s further possible to browse files directly on the server. Any program changed by the operator and sent back to DNC-Max can be automatically raised in version or stored in a quarantine area. This gives you the ability to track changes and revert to any previous version if necessary. DNC-Max is the complete DNC solution for all your CNC equipment. In addition to standard Fanuc/Haas style controls DNC-Max includes comprehensive support for Heidenhain, Mazak, Fagor, and many others. DNC-Max works with off-the-shelf, industry standard RS-232 serial communications hardware, including Ethernet and Wireless serial device servers, traditional card based hardware, and existing legacy hardware. DNC-Max supports 1 up to 4000 simultaneous ports for DNC or drip-feed when combined with industry standard RS-232 communications hardware from companies such as MOXA, Quatech, DIGI, and others.